Animation and holidays have often crossed paths. There have been countless Christmas and Halloween themed specials and movies over the decades, many of them utilizing animated characters. Less common are animated movies themed around the Thanksgiving holiday. 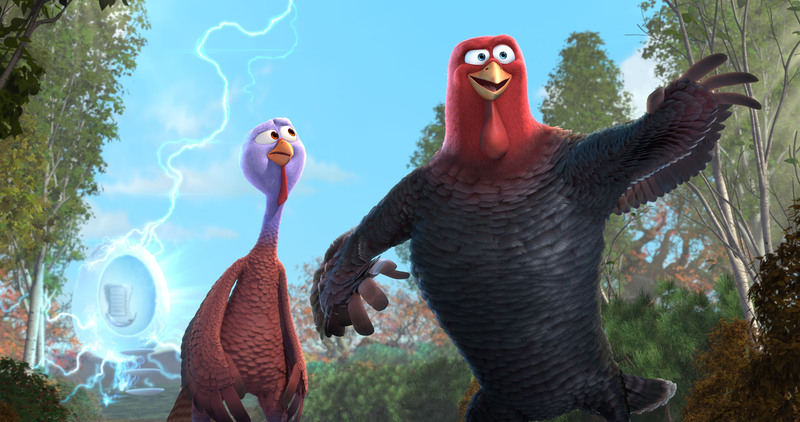 Less common still are Thanksgiving animated movies that are released theatrical. As such, 2013’s Free Birds is something of an oddity by nature, and even more odd in concept. Unfortunately, as different as it may sound on paper, Free Birds ends up feeling generic and forgettable due to its uninspired execution and uneven storytelling. The story of Free Birds focuses on Reggie (Owen Wilson), a domesticated turkey who is considerably smarter than the rest of his flock. Reggie lives in fear knowing that the farmer is slowly fattening them up to one day eat them, while the rest of the flock is blissfully ignorant to their impending fate. Reggie is later pardoned by the President of the United States for Thanksgiving, and begins living a spoiled life before he is kidnapped by a larger, dimwitted wild turkey named Jake (Woody Harrelson). Jake has kidnapped Reggie under orders from a supposed deity called the Great Turkey, as part of a mission to infiltrate a secret government base and steal a time machine so they can travel to the first Thanksgiving and prevent turkeys from becoming the food of choice of the holiday. If that premise sounds enticingly off-the-wall, don’t get your hopes up. While the premise is admittedly novel, the movie almost immediately falls into every predictable animation cliche you can think of. Main character who’s misunderstood by the rest of society? Check! Big, goofy sidekick who intentionally steals the show? Check! A female character who ultimately only exists so the main character can have a love interest? Check! A token attempt at a sad moment (even though the very nature of this particular movie doesn’t warrant such a thing)? Check! Look, I could go on. Long story short, Free Birds sticks to tried-and-true tropes without ever feeling the need to branch out or even add some originality to the mix. There are a couple of funny jokes here and there, but the writing ultimately feels flat and the majority of humor is lacking. Still, I suppose the movie deserves some credit for being surprisingly well for being the first feature film to come out of Real FX Creative Studios. It doesn’t look great (though some of the time travel effects are impressive), but given the circumstances it could look a lot worse. The voice work is also pleasant, with Amy Poehler voicing the aforementioned love interest, and George Takei voicing the time machine. But the animation and voice work just can’t save the movie from itself. The plot runs out of steam really quickly, the writing is bland, the characters cliched and uninteresting, and the movie strangely starts to take itself too seriously in the second half, but by its very nature of being a movie about time traveling turkeys it’s just too goofy to justify any seriousness (that previously mentioned “sad moment” might actually elicit a chuckle for being so misplaced). Despite some promise, Free Birds ends up feeling as dumb as a turkey. I have no thanks to give it.